Description: Fast ink- absorb, strong tacky type, dry faster(dry time:1.8 minutes).The tacky level also depends on your fabric spandex material. Most suitable for elastic textile such as sportswear. 1. Quality Assurance: Our company has set up several automatic assembly lines, and we also own mature product formulas, modern R&D and testing centers, skilled technicians and a strong management team. All these have enabled us to meet any special needs from customers. 2. Environmental Protection: We invested huge funds and efforts into the improvement of production procedures and the renovation of equipment. Our company is now a 100% environmentally-friendly company. 3. Reasonable Pricing: We have our own factory and now 16 lines in our factory in total. We guarantee the most reasonable pricing and give the most profit to our clients. 4. 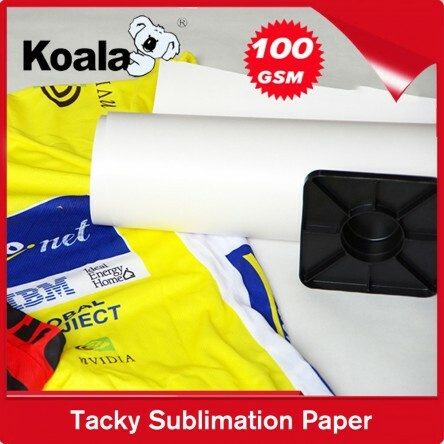 Caring Service: Through years of efforts, KoalaPaper has become a famous trademark in Chinese inkjet printing industry and our products have been sold to buyers from North America, South America, Europe, Asia and many other oversea markets. A: With the Dye Sublimation Transfer Process, you can print high quality digital images on a huge variety of items made of any material that is treated or polymer coated or garments made of polyester. The imprinting is accomplished using a printer, special sublimation inks, paper and a heat press. Q: What is Sublimation (Dye Sublimation Transfer)? A: Dye Sublimation Transfer is a process where you take an image that has been created digitally (either by scanning, downloaded from a digital camera or created on your computer). The image can then be printed with a printer using special sublimation transfer inks onto transfer paper. When heated to high temperatures, sublimation ink turns into a gas. Pores of the polymer coated item open up and allow the gas to enter. Then, once removed from the heat, the pores of the polymer substrate close up, trapping the ink inside. The entire image will be smooth to the touch. This is a transfer process in which the image becomes a part of the actual item. 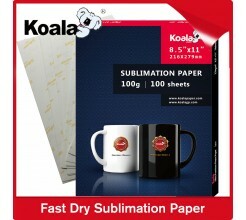 Sublimation needs special ink, paper and specific substrates with polymer coating to work. A: Basically, you're transferring a special ink onto a special surface using heat. Using your Epson inkjet printer equipped with sublimation inks, you print to a high-quality inkjet coated paper. Then you position your printed page against the item to be printed (image facing the item), secure it if you need to (recommended for mugs and other hard items). You may want to use a Teflon sheet (or pellon sheet for mugs) to protect your item from scorching and to keep "ghost images" from being deposited on your heat platen, which may later be transferred to the next item you press (Just position the sheet between the heat element and the item). Then press. Be careful when removing the printed sheet, if it shifts against the item you printed, it may produce a "ghost image". Q: What printer do I need? A: Our manufacturer has only been able to adapt this process to Epson printers. The Epson Stylus 800, 850, and 900 are the smaller printers that can be adapted. The Epson 1520 and 3000 are also adaptable to the process and can print much larger areas. Remember - It may not be better for your purposes to have a larger printer. If the items you will be printing are smaller than 8"X10.5", you will only need the 800, 850, or 900. Also, be aware of the area limitations of your heat press. The 3000 uses 4 separate ink cartridges, (CMYK), while some other printers use one black cartridge and one tri-color cartridge. Q:What type of Heat Transfer Press do I need? A: A heat press is the machine that presses a transfer onto an imprint able substrate. Using high temperatures and specified pressures for a certain amount of time, the transfer is permanently embedded into the product. Heat presses are available with various sized platens, with clamshell or swing away heating elements, and with manual or automatic release features. Some heat presses are created for specific uses, such as the cap or mug presses. The maximum print size of your printer should match the platen size of your press. Heat presses are recommended for professional and satisfying results simply because standard laminating devices and home hand irons cannot get near the temperatures required for a reliable transfer. 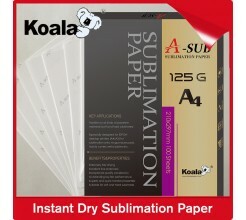 Sublimation transfers require anywhere from 375° to 425° F and demand serious force in pressing often from 40-80 psi. These temperatures and pressures are not possible with other heated device.